Queensland is flooding, and being a short-staffed week at the radio station, I'm like a scalped whale at the moment: I've got water on the brain. Emergency Services are quite rightly getting fed up with people ignoring "Road Closed" signs, and crossing flooded motorways and streets. These intrepid adventurers take a punt that their Magna or Cruze can handle half a metre of muddy brown H20 - but the result is a inevitably a parade of surprise-looking wet people standing on the roof of their automobiles awaiting a swift water rescue team. Police are even starting to charge people who they believe have ignored advice and recklessly entered floodwaters. 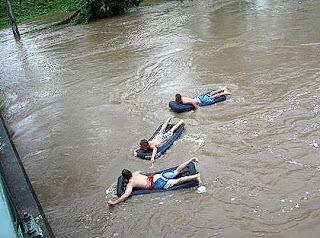 One such example is the case of the Bremer River Three - a trio of teenagers who decided floating from Ipswich to Brisbane on inflatable mattresses would be a top notch way to spend a Monday. If nothing else, they've forgotten to "slip" on a shirt. Tsk. Now, I can wholeheartedly agree with the official line that this is foolish and risky behaviour. Essentially these three are the biggest d***s in the 'swich since that peculiar tattoo-gone-wrong case. ...part of me couldn't help thinking "Gosh DARN it that looks like a top notch way to spend a Monday." Back when I was a kid, before the second Cash's Crossing bridge went in, Pine River always used to flood after a big storm at Albany Creek. The little streams and tributary water systems that led into the river via a tangled mess of lantana and scrub would spill over their dirt banks and start to resemble a Wet & Wild attraction. One such flood happened not long after my brother and I had received bright neon boogie boards for Christmas. Dad took us down to the creek, and we hit that fast-flowing water like the local teenagers would hit their home-made bongs - with gusto. Flashes of orange and yellow could be seen twisting and turning through the green as we surfed our way to the river itself - where we'd get up, shake off the excess, then head right back to the start. Similarly, The Wah has told me of his adventures as a young 'un in tropical Bowen, the Gem of the Coral Coast, in which he and a few chums would spend a day riding inner tubes all the way to the mouth of the River Don - as long as you remembered to paddle to a bank before being swept out on the sea tide, you'd be fine. Now both The Wah and I come from nautically-inclined families, but we can't be the only ones who spent a portion of their childhoods engaged in water-related foolish behaviour. At the very least, surely some other Brisbane-based readers may have gone to Amazons at Jindalee - one of Australia's dodgiest, yet most-beloved water parks. Getting on their greasy pole or half-slides alone counted as high-risk tomfoolery. When I was a teenager there were some kids playing in a shallow but fast running creek on Moreton Island. They'd surf all the way to the edge before jumping up and running to the top again. Of course, one kid pushed it too far and got sucked straight out past the shoreline. My uncle and I had to rush in after him and pluck him from the shark infested waters. Quite terrifying. great memories of myself, sisters and large group of neighbourhood children jumping into flooded kedron brook at thistle street and out at Kedron Park hotel - running back up road and repeating - with all our parents on bank encouraging the fun. Jetty jumping was our favourite way to spend our days in summer school holidays. There's no way I'd do it now, but back then it seemed the coolest thing ever! I remember one lonnnng boring rainstorm. It wasn't lighting or thundering just raining... Out parents took us three kids and some shampoo, conditioner and soap and we all took "showers" in the rain on the drive way in our swimsuits. Ridiculous, because I'm sure we weren't getting any cleaner... but a great memory! I just wonder what the neighbors thought!? one kid pushed it too far and got sucked straight out past the shoreline.